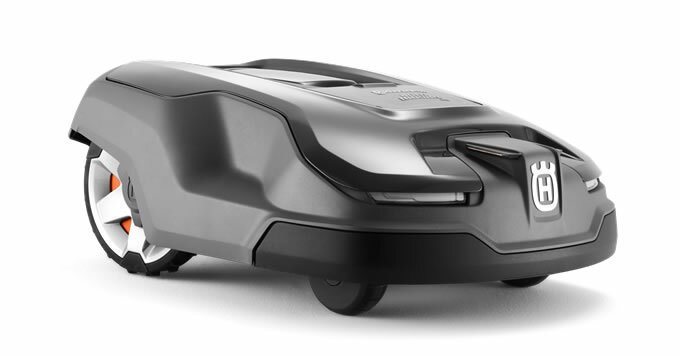 A premium robotic lawn mower from Husqvarna. Allowing you to sit back and relax while the mower does all the work, Husqvarna's Automower range is revolutionising how people look after their lawns across the UK. The Automower uses intelligent mowing patterns to ensure the grass on your lawn is cut from multiple directions with its razor sharp blades, facilitating healthy, strong grass that is lush and green. The key to a beautiful lawn is cutting little and often, something that an Automower from Husqvarna is quite simply designed to do. This model also features a spot cutting mode, so that you can have it mowing thicker areas such as under obstacles, while it is able to mow slopes up to 40 percent incline. Husqvarna's Automower 315X can handle lawns up to 1600 m2 and boasts GPS-assisted navigation to keep track of what it has mown and when, ensuring your entire lawn is covered in the most efficient way possible. It can cope with narrow passages, automatically navigating through them and choosing different paths each time to avoid marking the lawn. A weather timer allows the machine to mow more as the grass growth rate increases, and when the battery runs low it will automatically find its way back to the docking station for a top up. This model comes complete with Husqvarna's Automower Connect system, whereby you can track and control the Automower using a smartphone, starting, stopping and changing settings as desired. With an easy to use graphic display panel, you can also do this on the machine itself if desired. This is an extremely quiet, extremely efficient machine that, thanks to its battery technology, is also easy to use. A weatherproof model, it can operate around the clock and in any conditions to suit you. For safety and security, a PIN code lock, anti-theft alarm and lift and tilt sensors are all provided, while the 315X also benefits from the GPS tracking that means you can see exactly where your machine is at any time. LED headlights allow it to be extra visible while working.